I have found the Fein multimaster to be the best tool to use when sanding and cutting fiberglass. I purchased one with the variable speed control, but I have never changed the speed from the "high" setting. If I were to purchase another one, it would be the one with the fixed speed setting as it is a bit cheaper. The attachment for sanding has been a problem for me. The supplied sandpaper uses Velcro to attach to the tool. The sand paper would not stay attached and the sand paper wore down too quickly. Both of these caused some minor frustration for me. To solve the problem of the sand paper staying attached to the tool, I thought I would dispense with the Velcro. Instead, I used some 3M #77 adhesive. I bought some heavy duty sandpaper. Using one of the orignal pieces of sand paper as a template, I cut out a piece to fit the sanding attachment. Then I used a punch I had purchased from Harbor Freight to make make a hole in the center of the sandpaper so I could access the screw which holds the attachment on the tool. This worked quite well and I was pleased. However, the heavy duty sand paper I had purchased, wore out too quickly. I looked around for better sand paper but didn't find anything I liked. Then, one day I was using my belt sander and the light in my head came on! Why not use belt sander sand paper. So, I purchased some 36 grit sand paper for a belt sander. I cut it to shape, punched a hole in the middle and then glued it to the sanding attachment. It works GREAT! I have been using that one piece of sand paper for several months. 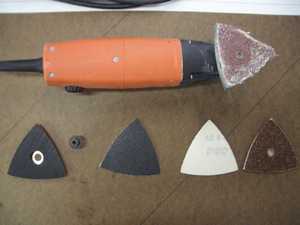 The lower left shows the sanding attachment for the Fein Multimaster. The next item is the scew used to hold the attachment to the Fein Multimaster. The middle two pieces of sand paper are the sand paper supplied with the tool. One shows the sanding side and the other the Velcro side. The sanding paper on the right side is my first attempt at using heaving duty sanding paper which I cut to shape and punched a hole in the middle. The top of the picture shows the tool with a piece of sand paper for a sanding belt. This is what it looks like after several months of use. Many times when using peel ply you only need a strip a couple of inches wide. When I first started using it, I would cut these strips parallel to the edges of the roll of peel ply. I would then apply it to the epoxy saturated fiberglass. When the epoxy cured, I would pull up the peel ply. Unfortunately, long threads of peel ply, along the edges, would remain embedded in the fiberglass. This was always a pain to remove. To prevent this from happening, I started to cut peel ply strips on a 45 degree bias, like when cutting BID. These strips of peel ply do not have the threads parallel to the edges of the strips. When pulling these up from the cured epoxy, they do not leave long threads embedded in the epoxy. Another advantage of using this method is, it is easier to wrap the peel ply around corners. Since the peel ply is not as soft as BID, it doesn't wrap as easily as BID, but it does wrap much easier than peel ply that has the threads parallel to the edges of the strip. In chapter 9, I had to drill holes for the landing gear mounting bolts. The ones through the landing gear bulkheads were 5/8" inch and went through a metal plate, then through 1/4" of fiberglass then through another metal plate. The holes in the landing gear tabs were 3/4" through fiberglass only. The plans recommend using a specialty tool called a LongEze spot facing tool. This tool is expensive and to be honest, very difficult to use. I spent many hours drilling the first hole. For the second hole, I asked my friend, Jeff Owen for some advice. Jeff was a machinist in a previous life and he is currently designing the engine installation for me. He helped me with one of the 5/8" inch holes in the landing gear bulkhead. After a couple of hours, he had had enough! He knew there must be a better way. So, he examined the bit and decided to make some modifications to it. After the modifications, the bit went through the metal like a hot knife through butter. It also worked well on the fiberglass. The problem with the bit appears to be with the four very small pointed tips on the edge of the bit. These tips are there to create a circular channel in the fiberglass. Then, when the main part of the bit starts cutting the fiberglass, it doesn't tear it. Unfortunately, due to their small size, they dull very quickly. Jeff removed the tips and then the bit went through both the metal and fiberglass very quickly. After removing the tips, the time to drill the holes went from 6-hours for the first hole to 2-hours for the second hole (the tips were removed half-way through this hole), to about 15 minutes for the two remaining holes. I consider this modification a success! Removing the tips does not appear to be a problem for the holes on the landing gear bulkheads as both sides are faced with a metal plates. However, on the landing gear tabs, it could be a problem. So, what I did was to start the holes using the 3/4" spot facing tool before it was modified. I drilled each side of the two holes in the landing gear tabs till tips had created a circle around the outside of the holes down to the depth of the tips. Then Jeff removed the tips and we completed drilling the holes out. Doing this really speeded up the process of drilling the holes. One word of caution, this tool is also used to drill the holes for the wing bolts. Now that these tools have been modified it will be interesting to see how they will work on the rest of the project.